In what was an epic, nearly four-hour heads up battle, Bertrand ‘ElkY’ Grospellier is the last man standing and the latest WSOP bracelet winner. After being down to less than 200,000 and at a nearly 24:1 deficit when the limits were 50,000-100,000, ElkY managed to storm back to take the lead against his heads up opponent Steve Landfish. The two exchanged the lead on numerous occasions afterwards but ElkY came through and win his first WSOP bracelet and the $331,639 that goes with it. The day started with 14 players and we quickly lost several notables including Jason Mercier and Ville Wahlbeck. Sorel Mizzi and Men Nguyen were also knocked out while Nick Schulman lost moments after Nguyen and was the final table bubble boy. 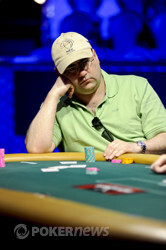 Landfish, who entered the day as the chip leader, was near the top of the leaderboard for the final day all the way down to the final table. Chris Tryba was quickly eliminated at the final table while Kevin Tang, Chad Brown and Alexander Kostritsyn followed suit. A key moment for Grospellier at the final table was when he doubled through Brown. Brown was ahead with a pair of aces on third and continued to stay ahead when he made two pair on sixth against the two pair and flush draw of ElkY. However Elky nailed a to give him a diamond flush and the key double up. John Hennigan entered the final table with a slight lead over Landfish but came in fourth after he took a big hit at the hands of Landfish and third place finisher Maxwell Troy, who had a very impressive run at the final table, in back to back hands. When heads up play began, Landfish held a 2,260,000 to 1,520,000 lead over ElkY. Landfish quickly built on that lead and had ElkY extremely short. Amazingly, ElkY came all the way back to take the lead without even having been all in against his heads up opponent up to that point. The two traded the chip lead back and forth until Grospellier landed a dramatic double up. He was all in on fourth and ahead with two pair, tens and eights. Landfish held a pair of kings but failed to improve as ElkY survived. ElkY went on to take the lead, then give it back, but once he finally reclaimed it, that was all he would need. On the final hand, Landfish was all in and at risk with / while ElkY held / . Grospellier made a pair of fives on fourth but Landfish picked up a flush draw. ElkY stayed in the lead on fifth while Landfish made a pair of fours. ElkY made two pair on sixth while Landfish failed to improve and when ElkY hit a full house on seventh, Landfish was drawing dead which gave ElkY the win. 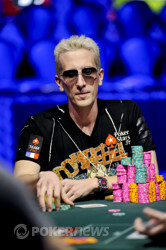 The win gives ElkY the triple crown to go along with his ‘08 WPT Championship win for $1,411,015 and his PCA win for $2,000,000 earlier that year. He is this WSOP’s second triple crown winner after Jake Cody and the fourth winner overall. 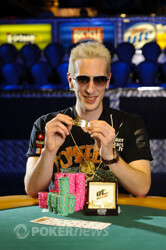 ElkY gets his WSOP Bracelet. He grinds it out in a long heads up battle to capture the hardware. Bertrand Grospellier completed and then called the two bets when Steve Landfish raised. Landfish bet on the turn and was called before Grospellier raised on fifth street. Landfish put in three bets and Grospellier called that plus another bet on sixth street. Both players checked seventh and Landfish showed a massive missed draw holding of for just a pair of threes. Grospellier flipped for two pair and picked up the huge pot leaving Landfish with just about 300,000 remaining. Landfish started off ahead but then Grospellier made a pair of fives on fourth to go into the lead, Landfish continued to brick as Grospellier improved to two pair on sixth. Finally Landfish flipped his final card, it was the red and offered Grospellier his hand. ElkY shook it and flipped the to make an unneeded full house before going to celebrate with all the French supporters on his rail. Landfish for his part takes home over $200,000 and memories of one of the most topsy-turvy heads up encounters we've seen at the WSOP this year. Bertrand Grospellier brought in and raised after Steve Landfish completed. Landfish re-raised and ElkY called. On the next two streets, Landfish bet and Elky Called. However on sixth ElkY bet which got Landfish to fold. We're now into the tenth level of the day. We're meant to stop in an hour, will this finish before then? As you can tell by the action for the last four hours or so, we don't have a clue! And when we bring in golf references, we mean them. Steve Landfish completed then put in three bets when Bertrand Grospellier called, Landfish bet fourth street before check-calling on fifth. When ElkY hit his fourth club (the proverbial 'golf bag') Landfish simply open mucked, showing the . And with that the Frenchman retook the chip lead. Steve Landfish brought in and called after Bertrand Grospellier completed. ElkY bet on fourth and Landfish called. Landfish was the one who bet on fifth when he paired up and ElkY called. Landfish bet again on sixth only to get raised by ElkY. Landfish called and seventh was checked by both players. Landfish showed for two pair which was good as ElkY mucked. Landfish regained the chip lead once more. ElkY celebrates with his fans and the media. Bertrand "ElkY" Grospellier is the bracelet winner in event 21.